2 nights of camping for those with limited time for those wanting to experience the Inca Trail and entering Machu Picchu via la puerto del sol, Inti Punku or the Sun Gate 42 miles total hiking. 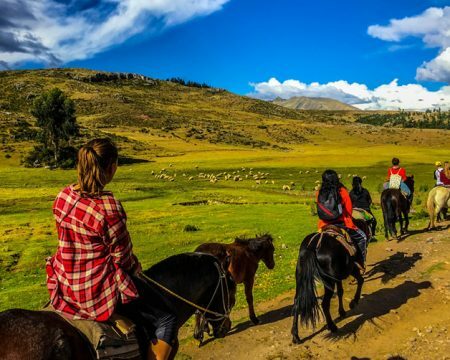 Day 01: Cusco, Llaqtapata, Huayllabamba, Llulluchapampa. 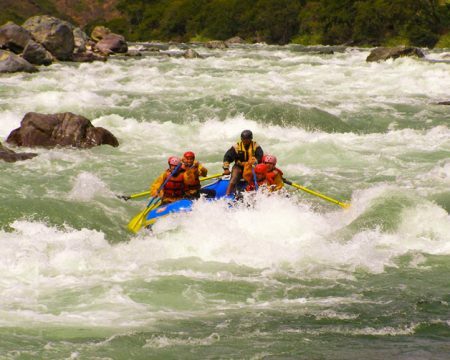 Day 02: Llulluchapampa, Warmiwañusca, Sayacmarca, Phuyupatamarca. 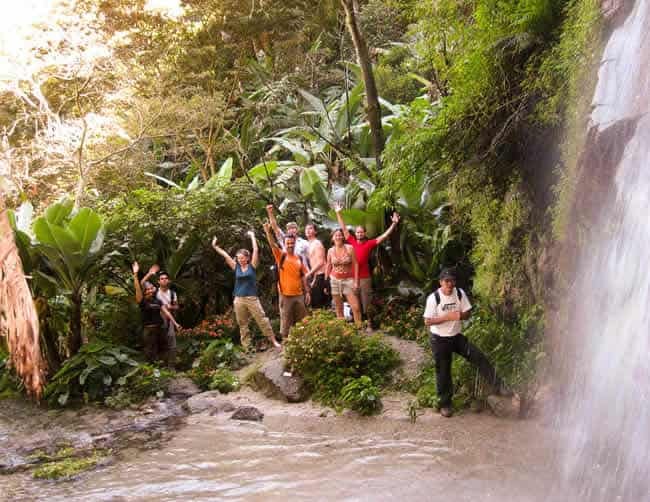 You will be greeted at your hotel at 5:40 am and taken to 88 kilometer on the rail line to begin the hike at 9AM. The walk will begin leisurely to ensure you are acclimated to the pace and elevation. 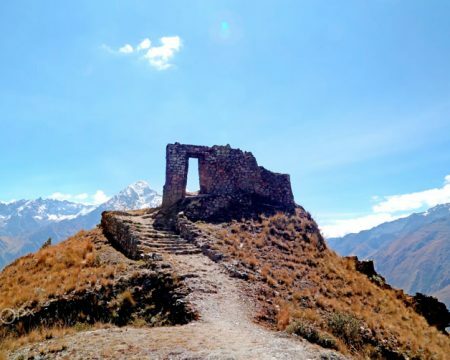 First we will reach the archaeological complex of Patallaqta (2.550 m.). Then we will continue to walk through the Huayllabamba valley first noticing the ecological changes while we ascend to Yuncos Chimpana. Before camping we will continue higher to Llulluchapampa (3750 m). After breakfast start the trek with spectacular views of the valley below and Huayanay (4.200 m) above. From Warmiwañusca, also called dead woman, you will see and be able to appreciate the small complex of Runkurakay (3.860 meters). 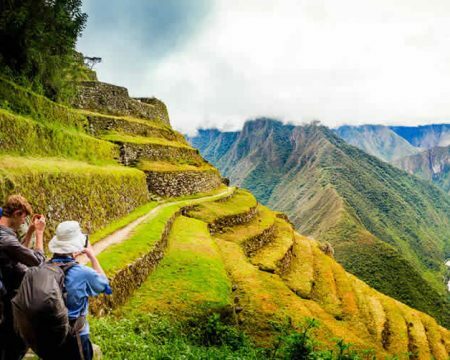 Great views of Sayacmarca valleys and snowcapped mountains. 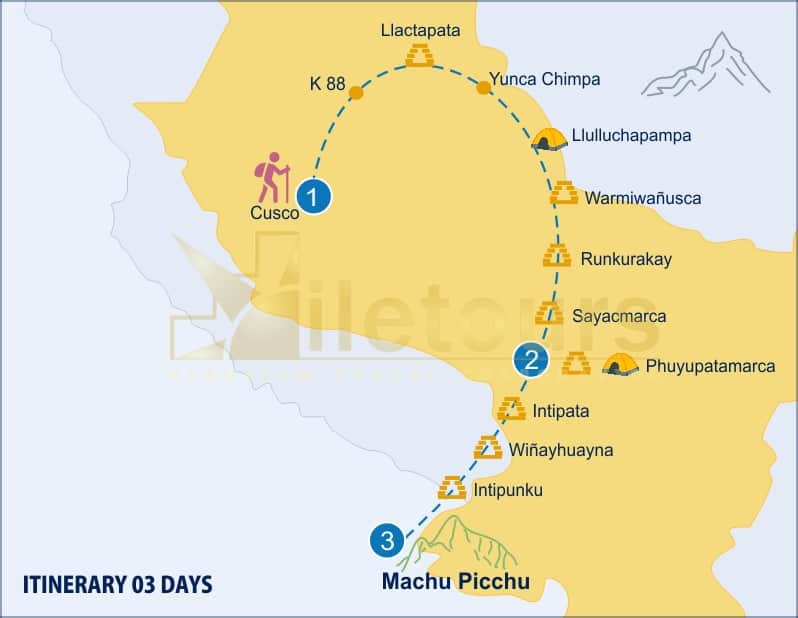 We will continue on to the complex of Phuyupatamarca where we will camp for the night. Day 03: Phuyupatamarca, Inti Pata, Wiñayhuayna, Intipunku, Machu Picchu. 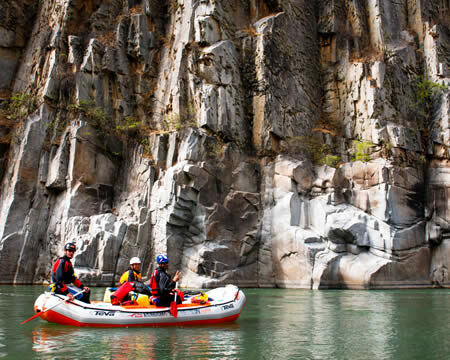 Rise for an early breakfast and visit the archaeological complex of Phuyupatamarca. 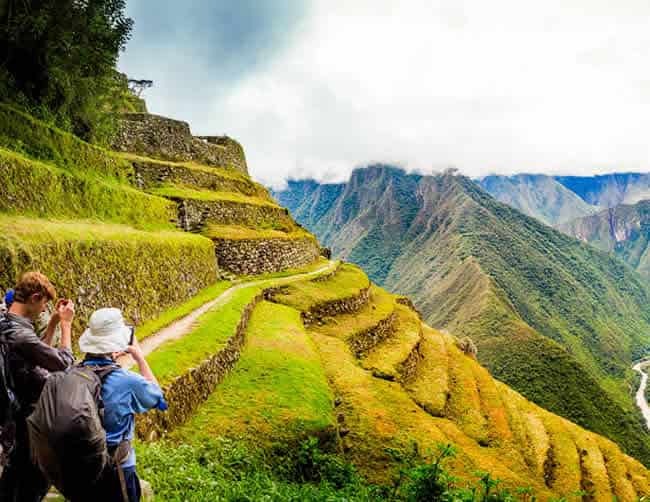 Then hike 3 miles to Wiñaywayna and visit the Intipata Wiñaywayna complex. Next continue until we reach Inti punku or la Puerta del Sol (Sun Gate) around sunrise. 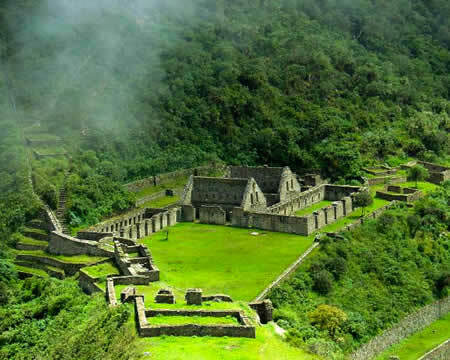 From here you will get your first perspective of many of the sublime magnificence that is the citadel of Machu Picchu. 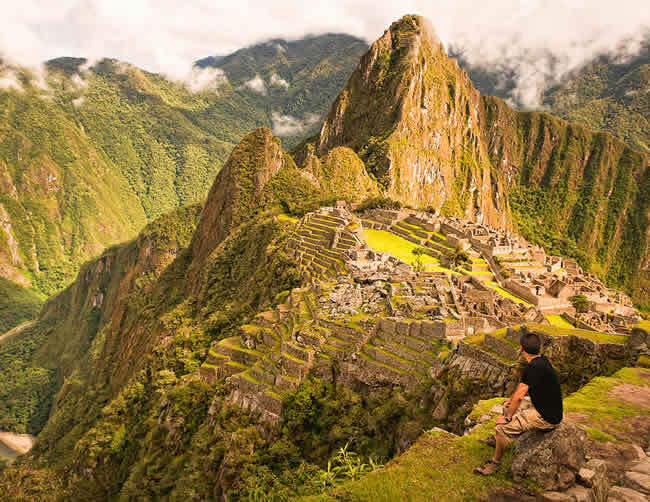 Often called the Lost City of the Incas Machu Picchu mostly because the Spanish conquistadors never found it in the mid 16th century. After a short visit take one of the continuing running buses back down to Aguas Calientes and ascend to Machu Picchu by bus for our guided tour. 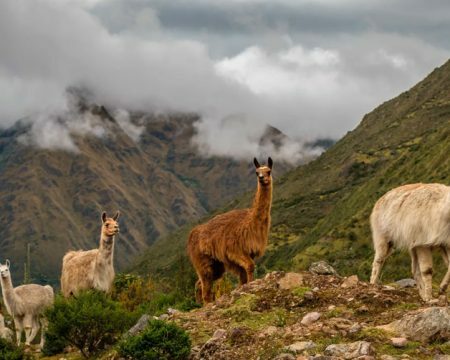 You will have time to experience Machu Picchu on your own after the tour before descending to Aguas Calientes by bus for taking your train back to Ollantaytambo. From there you will be driven 90 minutes to Cusco’s San Francisco Plaza where you can easily walk back to your hotel. 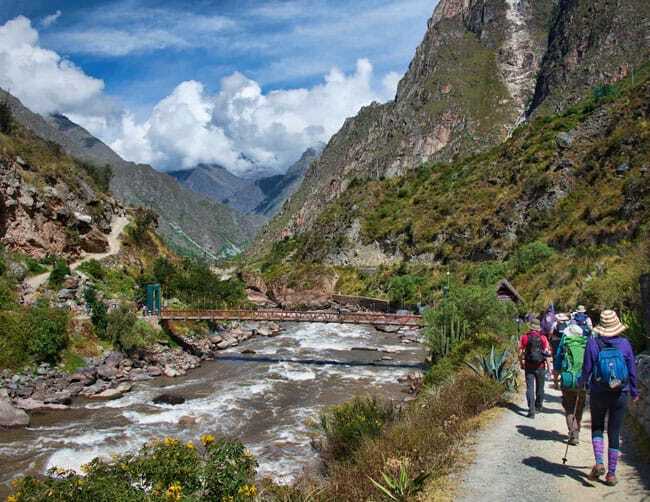 Backpacker class train from Aguas Calientes – Poroy (Cusco). Bus from Aguas Caliente – Machu picchu – Aguas Calientes.